Dynatel 965 Subscriber Loop Analyzer. 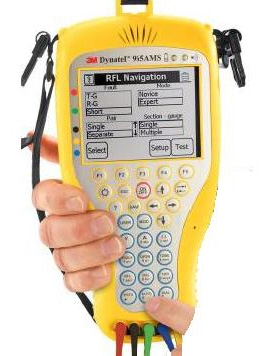 The Dynatel 965 subscriber loop analyzer performs all the tests needed to analyze and troubleshoot the subscriber loop, as well as cable plant in a single, portable unit. 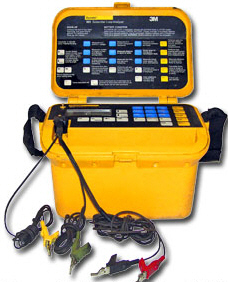 In addition, the 965 uses combinations of its test measurements in automatic functions called DC Line Test and AC Line Test, which interpret results and lead the operator toward possible solutions to complex cable problems. Noise immunity 7 Vac , Precision tones 404, 1004, 2804 Hz Tracing tone 577.5 Hz, Harmonic distortion <45 dB (up to 10th harmonic), Variable source 50 Hz to 10 kHz, operates on 5 C cell alkaline or rechargeable NiCd batteries. Typical battery life No backlight 40 hrs NiCd -120 hrs alkaline, With backlight 12 hrs NiCd- 35 hrs alkaline, Size H x W x D 7.0 x 10.5 x 7.5 , 5 ft cord, Net weight lbs.7.5, Operating temperature 0° to 140°F , Relative humidity 0-100% condensing, Operating altitude 0-15,000 ft.